Bruce Boudreau is pinching himself these days to make sure it's all still real. The 53-year-old coach has a history of winning big games, but until now they've all been in the minor leagues. That he is potentially only a couple of wins away from taking the Washington Capitals to the Stanley Cup Playoffs, it's almost like a fantasy. "I have to control my own nerves," Boudreau said Monday during a conference call arranged by the NHL Public Relations Department. "I'm usually watching the race for the Stanley Cup." To an extent he still is, only this season it's from a very different vantage point. The Capitals are one of six teams sitting on the proverbial playoff bubble in the Eastern Conference. It would appear - although nothing is official in this wild season - that the first six spots are taken with the Rangers' hot play of late, so players, coaches and fans in Philadelphia, Boston, Washington, Buffalo, Florida and Toronto officially are on standings-watch. They're as fluid as they've ever been, so no one can look away. "All of my teammates watch the results, like Boston or Philadelphia, and what the standings are," Capitals superstar Alex Ovechkin said on the same conference call. "I like this atmosphere. I like being in this spot. I like that everyday anything can happen." Tuesday, though, could be a seminal night for one or more of the bubble teams. All six are on the ice beginning at 7 p.m. ET, when Buffalo hosts Ottawa and Washington goes against Carolina. Thirty minutes later Philadelphia is at the Rangers, Boston and Toronto meet north of the border, and Florida plays at Tampa Bay. "We're in it until the end," Sabres forward Drew Stafford told reporters. "We're not quitting." 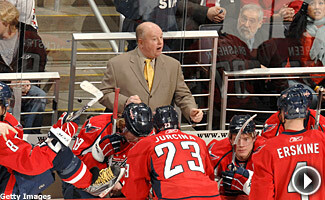 Neither are Boudreau's Capitals, who are in ninth with 82 points, only two behind the eighth-place Bruins. With a regulation win tonight, the Caps potentially could leap into an eighth-place tie and also crawl to within three points of the first in the Southeast Division. Two races, one destination. No wonder Boudreau is worried about his nerves. "We think it's going to take at least 92 points and anything can happen," said Boudreau, whose team would have to win five of its last six games to hit his predicted mark. "By hook or by crook, it doesn't matter how we get in or what position we get in, we just want to get in." If the Capitals do, it will be nothing short of spectacular. They seemingly were left for dead at Thanksgiving, but that's when GM George McPhee shook things up by promoting Boudreau from head coach of the AHL's Hershey Bears to interim coach of the NHL's Capitals. Boudreau immediately came in and started talking about winning the Stanley Cup. Was it farfetched at the time? Probably, but Boudreau knew what he was shooting for and he had to get his team to believe it could get there. "I never want to set the bar too low to where you're only trying to make the playoffs," said Boudreau, who shed the interim tag in January. "If you don't shoot for the moon, to me, you're not shooting high enough." In getting the Caps to buy into his Stanley Cup-is-our-destiny approach, Boudreau coached them back into playoff contention. The Capitals have remained there despite a topsy-turvy March that saw them all but written off by March 9 only to return to the race a week later, when they won their fourth in a row. "They're such a great, resilient group, and I think they were more angry than they were disappointed," Boudreau said of how the team felt after losing back-to-back games to Boston and Pittsburgh on March 8-9. "We had a couple of days after that to regroup. That gave us a chance to get everything going again. Then we had a four-game winning streak." Florida also is hoping its late-season magic will turn the playoff trick this season. The Panthers aren't in as enviable a position as the Capitals, being that they have 81 points. It's only a one-point difference, but Washington has to jump only one team to get in. The Panthers have to clear three, including the Sabres. Buffalo also has 81 points, but has played 75 games while the Panthers have played 76. Still, that Florida even is within striking distance of the playoffs is remarkable considering it has won eight of nine games (8-0-1) in March to get into this position. 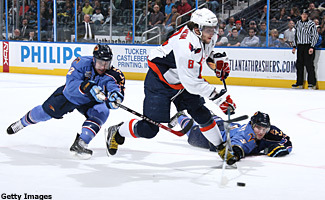 The Capitals' Alexander Ovechkin, who leads the NHL in goals and points, has his team in the hunt for a playoff berth. The Panthers play Washington twice in their final six games, including the season finale for both, in Washington. "We still have a lot of life, and you never know," Panthers goalie Tomas Vokoun told the Palm Beach Post. "We just have to be focused to the end and we'll see what happens." In similar fashion, the Maple Leafs surprisingly still are in the race with 80 points, when a month ago the hockey world was waiting for interim GM Cliff Fletcher to sell off as many parts as he could at the trade deadline to start a rebuilding project. The Leafs, who still have to leap four teams to reach eighth place, have stayed alive these last two weeks without their captain and leading scorer, Mats Sundin (groin), and second-leading scorer, Nik Antropov (knee). Others, most notably Alex Steen and Matt Stajan, have stepped up, but Toronto remains in dire straits. It begins a critical home-and-home against Boston on Tuesday. Win both and the Leafs would be tied with the Bruins, who would still have a game-in-hand. That doesn't mean they'll be in the playoffs, however. Their fate, like the other bubble teams currently not located in Philadelphia or Boston, still depends on how others do. "We can't worry about what we have no control over," Boudreau said. "We can control if we win, and we're going to keep playing. That's the one thing we do know."